Aldi reviews and more! I have just launched and opened AldiMom.com! AldiMom.com will feature all Aldi related topics, such as Aldi product reviews, recipes using only Aldi brands, Aldi debate and discussion, information on Aldi, weekly deals, budget meal planning, and other Aldi chatter. In light of my new launching, I would like to share what inspired me to create AldiMom.com. I had previously ran an online blog about couponing, when I started shopping at Aldi and realized I didn't need to clip coupons and worry about a tight grocery list. I could go to Aldi, freely shop the isles and still meet my budget without losing the quality and taste of my family's meals. I wrote a blog about it (re-posted in my last post) and Aldi saw it and I received an email from them. They asked for my address because they wanted to show me something new Aldi was doing and thanked me for posting about them. I replied, and forgot about it. I didn't think much of it until about 6 weeks later I received a package from Aldi! I opened it, and what was inside was what you see in the image! They sent me a few recipes for some tasty summer treats, as well as a FULL-SIZE 4th of July sprinkles set, a full-size extra large chocolate bar, marshmallows, and a box of graham crackers and told me to enjoy! I was very impressed with what I saw...I just couldn't believe it, really. What company would go out of their way to thank someone for shopping at their store by sending them a package of items valued at over $10.00 (ALDI prices), plus the box, plus shipping, plus the time to organize all of this. I wasn't the only one who received a package, others did as well. It impressed me that the company would spend their own money just to thank their fans. 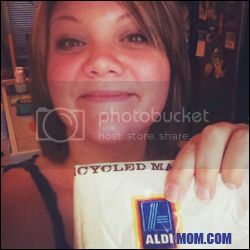 That's when I really fell in love with Aldi even more, and became inspired to launch AldiMom.com so I can share my new found love with other moms out there who are long time fans, new shoppers, or moms who haven't tried Aldi yet! Subscribe to my blog or follow me on Twitter to enjoy all of the fun things I plan on doing here at AldiMom.com! Bookmark me too and check out some of my Aldi reviews!